Recognizing an urgent need for serious changes in the way water is managed and used in the state, a broad array of stakeholders saw an opportunity to move beyond the traditional rancor and conflict by coming together to identify pragmatic and achievable solutions to urban water challenges. 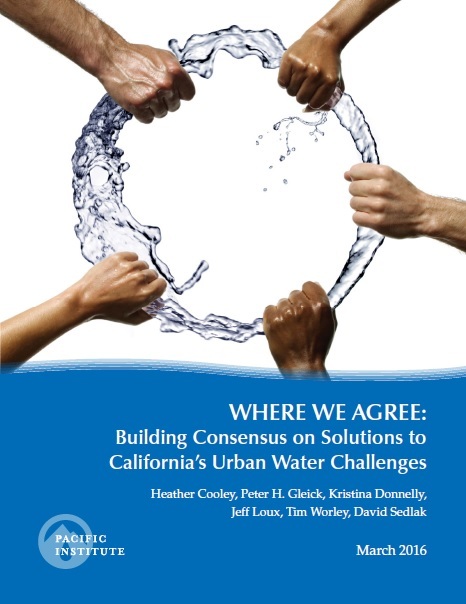 During 2015, the Pacific Institute, in partnership with the California-Nevada Section of the American Water Works Association, UC Berkeley Water Center, and UC Davis Extension’s Collaboration Center, coordinated a series of in-depth Where We Agree meetings. This unique effort provided participants opportunities to set aside differences and explore water technologies and policies that would have broad support. Together, they generated a set of practical recommendations for policymakers, municipal water managers, businesses, and community groups. And invest in groundwater storage and develop an integrated strategy for maximizing the potential of these projects. “Despite the perception of unresolvable water conflicts in California, there is broad consensus on many of the key strategies needed to tackle our water resource challenges. The outcome of these Where We Agree meetings offers a roadmap for sensible solutions that have a strong likelihood of public and political support and if implemented, could dramatically shift the way Californians use and manages water” said Cooley.